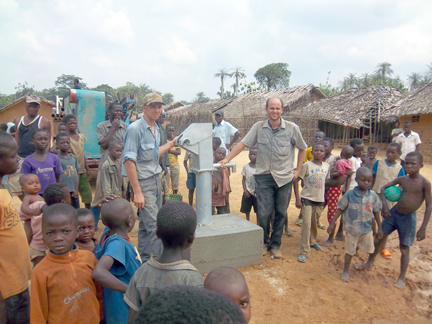 Elisha (left) and Nathan (right) with the new well. 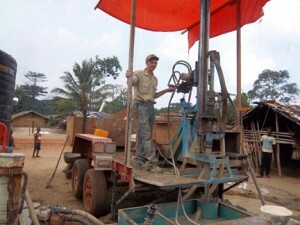 We had another adventure drilling wells in the bush recently. It was an incredible experience as most of the trips I have taken here usually are. We had a couple of delays as we started our trip. We were stopped by a police barricade for quite some time; then Nathan had a flat tire on his motorcycle. We made another stop at our well in a village 15 kilometers north of the mission. We did some repairs to the dirt around the pump as the water which spilled while filling jugs would run back to where one stood while pumping, making the area a big muddy mess. 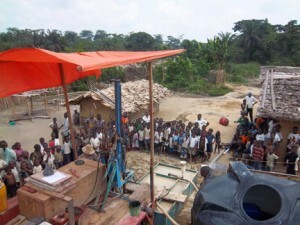 When we finished the repair, we put gravel that we had brought around the hand pump. After that, Nathan left with the motorcycle to scout out the road to the village of Alibuku where we would begin drilling. No one from Congo Frontline Missions had ever been to this place before, and with the condition of the roads here it is most helpful to know what lies ahead, especially when one is dragging a trailer behind. We were pleasantly surprised to find out that the road was quite good. It had been built by the Chinese who had previously done extensive logging of the area. Elisha on the trailer mounted drilling rig. When we finally arrived in the village of Alibuku, home to a population of 12,000, hundreds of people came to welcome us including the chief of the village. I cannot remember ever receiving a warmer welcome, and from people whom I had never even seen before. 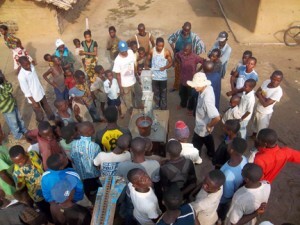 All of the wells in their village had recently dried up, and they had made a valiant effort to dig a new well by hand. They had dug it 30 feet deep, made their own retaining rings and raised the money to buy cement and a pump, but they did not know how to install the pump. While they were trying to find someone to put the pump in, the new well dried up also. They were getting desperate for water as they had to carry all the water for 12,000 people by hand from a small, dirty stream two kilometers away. 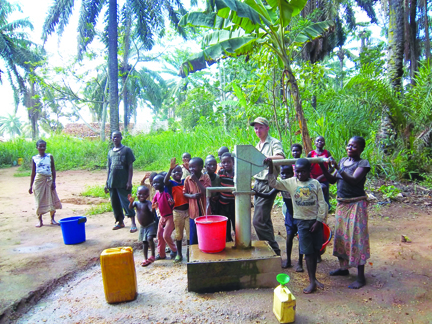 They sent some men from the village to CFM (Congo Frontline Missions) to beg us to come and help since they had heard that we drilled several wells on the route 30 kilometers from them. We were not able to come immediately as we were still getting our drilling unit mounted on our trailer and building a water trough to use for our bentonite mud pit. Usually when we arrive in a village it takes at least several hours of negotiating with the village leaders as to where the well should be put and to purchase the property. Then it would take us several more hours to anchor the drilling rig to the ground, dig pits for our mud and water before we could even begin to start drilling. Often there are major fights that result as some want it in one place and some in another. We have even been told to leave if it cannot be put in a certain place. We have strict policies about having total control over the property where we drill a well. There are several reasons for this, the biggest being that there is still a tremendous amount of fierce tribalism among many of the people here, and we do not want anyone to have control over a well and limit who can get water and who cannot. The well and the water from it are a free gift from us for everyone. The thrill of cool, clean water. Nathan had arrived a few minutes ahead of us at noon in Alibuku and that is all the time it took to decide on where the well should be put. The entire village had discussed it and agreed ahead of time where it should go. They chose a prefect location, in the center of the village on government property beside a large medical clinic. Nathan met us at the road and pointed to where we should stop 30 meters from the site. He was all smiles as he came and told us the good news. After the greeting and hand shaking were done, we all had prayer together and prepared to drill. We started drilling at 1:30 pm, and by 9:30 pm we had a well drilled 160 feet deep, the casing set and the concrete seal was poured around the outside of the casing. We hit soft shale at 70 feet, so we only had to put the casing down to that level and left the rest open through the shale. Both Nathan and I were very pleased with how our new mud trough worked, as well as having the rig mounted on the trailer. Drilling the well amidst a crowd of onlookers. You should have seen them all crowding in as close as they could. It can be really annoying to have so many people so close to where one is trying to work. For one thing, they all smell really bad, and for another, people understandably get upset when they get whacked with a pipe or sprayed by dirty drilling mud. We tried over and over again to get them all to stand back. We put up a rope 30 feet away from our work area, but they just would get to pushing and shoving on each other; the rope would get knocked down, and before we knew it they had all crept to within a few feet of us again. Even while we worked late into the night by the light of our flashlights, more and more people came to see what was happening. Thursday morning came all too early! Nathan and I were both quite tired. It had been after 11 pm before we had everything picked up, tied down, locked up and were cleaned up. Thankfully we did not have to guard everything, as Leo took the entire night shift. After breakfast, we began to clean and develop the new well. We hook a water jet to the end of the drill stem and run up and down the sides of the well using high pressure water to clean the mud and any loose deposits away. Usually it takes about as long to clean and develop a well as it does to drill it. By mid afternoon we had gotten all of the drill stem back out, removed our mud trough and were ready to start pumping water from the well. When we start pumping you should see all the women and kids who come to fill anything that will hold water – buckets, jugs, basins, jars, pots, pans, kettles, cups, hands and mouths. We put chlorine in all the water we drill with, as most of the time our only choice for water is from the river or a swamp. We usually try to pump a few thousand gallons or so from a new hole and then check to see how far the water level has dropped in the well. Then it is time to start installing the hand pump. 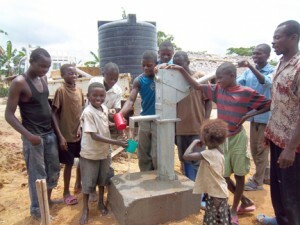 Children gather to inspect the new water pump. We were trying to decide if we had enough time to mix and pour the concrete for the pump base as a massive storm was on the horizon and beginning to bear down on us. About that time the wind really started blowing hard! And we all abandoned the cement job to batten down the hatches. We quickly got the tools all put in a safe place, covered up the cement bags and then ran to save the tents. We hardly had them fastened down, and it was all we could do to hold them from blowing away. They were bucking and billowing furiously in the wind. We managed to get one of the tents secured fairly well with ropes to the trailer, but when the tent poles started snapping on the second tent we decided it was time to take it down before it was totally destroyed and blew away. We quickly transferred all our gear from that tent to the cab of the truck and with a lot of painstaking effort succeeded in getting the wild beast, which was the tent, subdued, rolled up and put away. It rained really hard for a while; then the storm subsided into a slow miserable steady drizzle which lasted for hours. Many of the storms this time of year are very severe. They are often accompanied by winds of 50, 60 or 70 plus miles per hour. I have seen many large trees splintered like they were toothpicks and houses that have been blown down. Also the lightning here is unbelievable. They say Congo is the lightning capital of the world with more strikes per square foot than anywhere else on earth, and I do not doubt it one bit! It can be a real fire storm at times, and the noise from them hitting close is absolutely deafening. We have ridden out some pretty fierce storms inside of a tent, praying while we are lying on our backs with our feet on the walls trying to keep it somewhat upright so it will shed most of the water. The rain had nearly quit by 5:30 pm, so we finished setting the pump base and concrete forms, mixed, poured and smoothed the cement and covered it with plastic. A little before dark Nathan and I decided to take a walk around the village and see some of the sights. We went quite a ways and it was well after dark before we made it back. It was very interesting looking around the old logging camp and at the school where more than 1,200 children attend, as well as seeing many other things. We all went to bed early except for Leo, who was on guard duty all night again. Early Friday morning, we began installing the rest of the pump, breaking down camp and getting loaded up to leave. By 11 am, Nathan had finished giving instructions to the village leaders on how to maintain and service the pump. After a quick meal of good old rice and beans, we all said our goodbyes. Nathan and I left on the motorcycle to go and check out more potential well sites as well as to check on our two pumps on the road going north to Buta at 36 and 45 kilometers from the mission. William, Kyumba and Leo returned to the mission with the truck as we do not like having the guys out over the weekend unless we are far out and it is not an option to go back to the mission. After about an hour, we made it to our pump at 45 kilometers. We had been getting reports that it gets a lot of use, and we could tell that what we had been told was correct. We installed that pump in the middle of February, and already it was showing signs of significant wear at the end of May. As it was the middle of the day and very hot, there were not the long lines of people that the church planter said are often there, but there was still a steady stream of women and children coming to fill jugs, pots and buckets. We looked the pump over, tightened a few bolts and watched the people continue filling their containers while we spoke with the church planter. He told us that many people came from as far as three kilometers away to get water from the well. In the evenings, the line of people waiting to fill their containers is very long and often fights break out as the people often have to wait until long past dark to get their turn at the pump. Elisha with happy children at the new water pump. After prayer with our church planter, we headed back to the well at 36 kilometers. Conditions were much the same there, although we could tell the pump had not pumped nearly as much water as the well at 45 kilometers. We checked over this pump, talked with our church planter and watched while a few women got water. One lady carried over 10 gallons away on her head! She hung a 6 gallon jug on her back from a cloth around her forehead and then balanced a full 5 gallon bucket on the top of her head. About 3 pm we headed back to the mission station. We had a great trip back, and the police even saluted us at the Chopo bridge! It was much better than being stopped and harassed, though! We checked several more potential sites for wells that will have to wait for another trip. Nathan and I were quite tired and glad to get back home. It had been another full week, and riding 90 kilometers with the motorcycle on rough roads will wear one out. Drilling wells in the Democratic Republic of Congo has to be one of the most challenging, frustrating, tough, dirty, exhausting but most fulfilling things I have ever done in my life. To see the unspeakable joy on the faces of the children and villagers makes it all more than worth the effort! The huge smiles of gladness and their shouts of glee or the tears of joy streaming down faces is something that has touched me more deeply and given me more happiness than anything else ever has! There have been many things I have seen and experienced here in Congo that I will never forget, but one of the greatest is to see the villagers’ reaction when pure, cold, water starts coming up out of the ground. Oh, how much we take for granted in America! By Elisha Vande Voort. Email: harvester2188@gmail.com. Website: www.congofrontlinemissions.org.